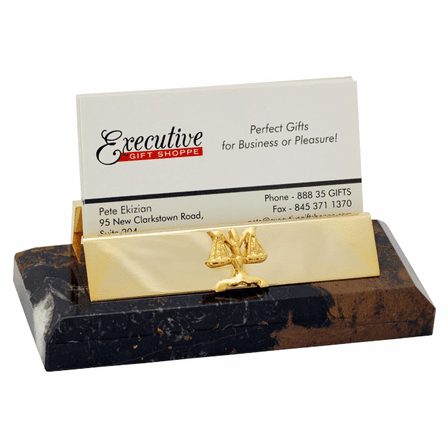 You don't have to be a lawyer to proudly display your business cards in this genuine marble desktop business card holder. The polished black marble base features unique gold veins running through it. 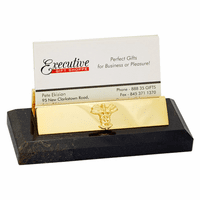 Attached to the top of the marble base is a card holder that holds up to twelve standard size business cards. The brass desktop business card holder has an attached Scales of Justice emblemm, perfect for lawyers, paralegals or anyone with a strong sense of justice! Can it be engraved and delivered by Friday? This item is in stock. If you order today, Wednesday, it would ship tomorrow. If you choose Next Day Air as your shipping method, you receive it on Friday. Very easy to order and was pleased with business card holder. 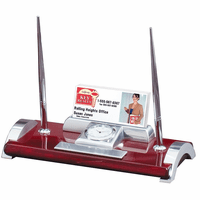 ProsVery easy to to order from site.